Since there is already a charity VansAirForce.net cap sighting component to this website, I thought it might be a nice idea to start a thread for 'Mothership' cap sightings. So please say hello to the 'Mothership' cap sighting sticky. The first entry? Mr. VanGrunsven himself. More to follow on these pics...(I'm told). OK, here’s the promised story to accompany the teaser photos of a couple days ago. Yes, I was fortunate enough to spend a day (& night) aboard the USS Carl Vinson aircraft carrier. The Carl Vinson is one of ten Nimitz class carriers, the largest carriers in the Navy inventory. I won’t bore you with vital statistics, as these are available in the referenced links. Suffice it to say that it is impressively large, sometimes noisy, ever impressive, etc. The source of my good fortune was that of being in favor with EAA headquarters. Apparently the Navy occasionally offers a block of such “Embarkations” available to EAA, as well as many other organizations. 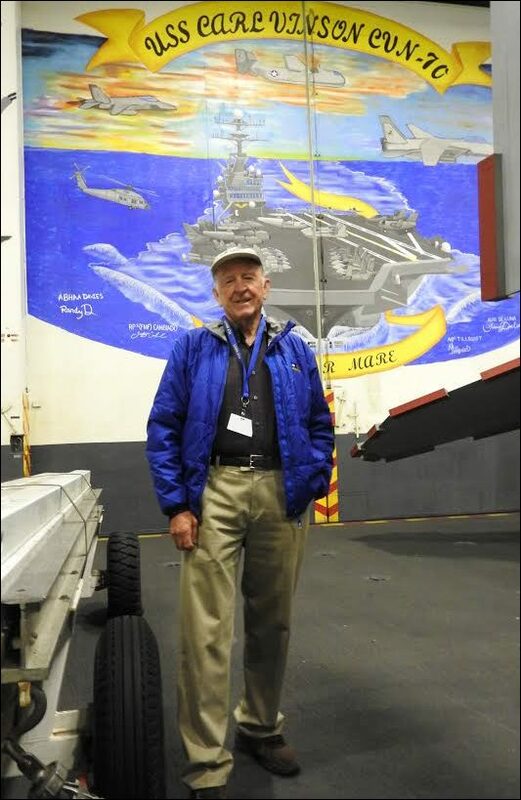 I had been aware that the Navy made such tours available to parents (grandparents?) of service members, and other special persons. Several people I had spoken with over the years had had this experience, and all simply raved about it. Thus, I was overwhelmed when offered this unexpected opportunity. I was a bit concerned about being cleared because of my age and past medical issues, but apparently I answered all of their screening questions adequately. "The Experience” consisted of being flown from San Diego’s North Bay Naval Air Station on board a C-2 “Greyhound” COD (Carrier Onboard Delivery) aircraft. Regional airliners are luxurious compared to this shore-to-ship shuttle, but none of us were complaining. There are only two side windows in the entire cabin/cargo section - no interior paneling, interior lights, etc. Boarding is via cargo loading ramps at the rear of the fuselage. The seats face rearward, and we were all wearing floatation vests and hard hats with ear muffs for sound suppression. Arrival onboard the carrier was not announced, and because we had apparently been flying around in low level turbulence for a while, had no way of knowing when we were on landing approach. Just a solid “thunk” of the wheels on the deck, and then being pushed back (forward) into our rearward facing seats. In about 2 second we came to a stop, the cable was detached, and we taxied off to the parking area. Thus began about 24 hours of a rather intense introduction to the tip of the arrow of the Navy’s strike force. Much of our time on board was spent touring various parts of the carrier and listening to talks on the vital and interrelated functions. I will not try to cover them all, but rather will just make a few random comments. One memorable briefing was given by a Rear Admiral who was in charge of the Carrier Strike Group. He looked younger than his presumed early fifties, and was an excellent speaker. While he was outlining Navy Carrier capabilities, world politics, etc., aircraft were making arrested landings and catapult launches from the deck above. These sounds and vibrations punctuated his talk and lent tangible drama to the presentation. Carriers in the Nimitz Class are often referred to as 4 ½ acres of sovereign U.S. territory which can be relocated anywhere in the waters that cover about 70% of our planet. As such, it makes them a unique and vital component of our nation’s military arm. Particularly in the military actions in which we have become involved in recent years, carriers are indispensable because of their flexibility. The meals served were very good. Dinner in the Officers mess, breakfast in the NCO’s mess, and lunch in the officer mess again. We sat with servicemen and were encouraged to ask question about their service experience and careers. All very interesting. Our Navy “tour guides” were surprised to learn that all in our group were pilots. Apparently most of their “Distinguished Visitors” are not pilots. I guess that this just affirms the fact that we are a very small minority. We had several opportunities to observe flight deck operations. Though the carrier is huge, by normal airport standards it is tiny. Thus, close viewing proximity to the action was assured. Because we were required to wear hard hats and protective goggles, photography was difficult. No flash photography was permitted, for obvious reasons. (I did get some decent photos and videos, but I’m sure that you can find better on YouTube.) We were planning to watch some night operations; by they were cancelled because of low clouds. 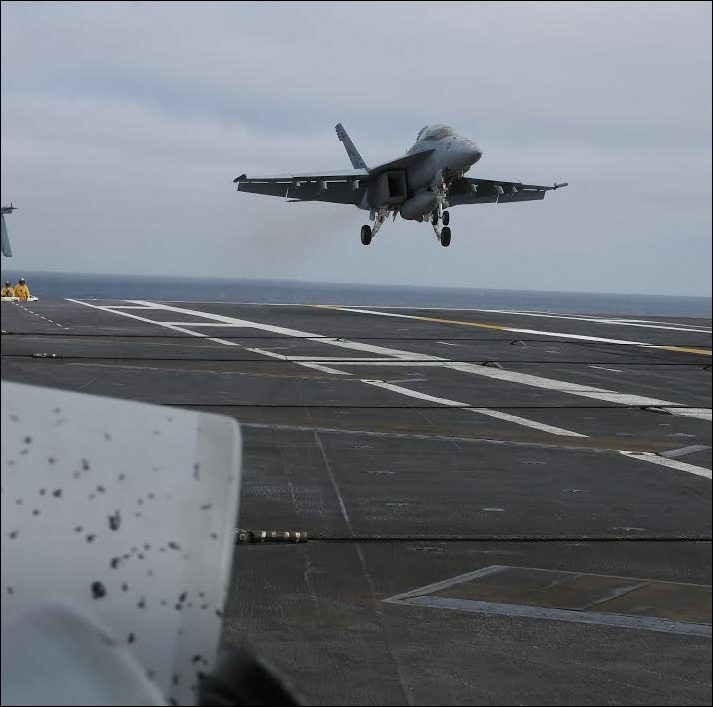 Though the Navy is capable launching and recovering under very marginal conditions, this stage of qualification and currency training required better conditions for safety reasons. The following day we were able to view flight operations from a command bridge several levels above the flight deck, which provided us a fabulous vantage point. One thing that struck me is the lack of personal space offered the typical seaman. We were shown their berthing rooms; bunk beds with about four levels, and adjacent lockers. (Many years ago as a junior officer in the USAF I had occasion to visit the Airmen’s barracks and noted the 4 per room accommodations which I noted as being small in contrast to my personal BOQ room. These carrier accommodations add new meaning to “compactness”.) When you realize that there are over 5000 souls on board, you can better appreciate the need to conserve space. While we didn’t have time so see what common space and recreational opportunities were afforded the crewmen, this lack of space caught me off guard. Now I better appreciate the meaning of “Military Service”, with emphasis on SERVICE. Speaking of space; everything on the ship is compact. The walkways, aisles, or whatever the nautical term, are narrow and the doorways (portals?) are narrower and require stepping through because their bases are raised above floor level. The stairways are all ladders, not stair steps and elevators as on cruise ships. Obviously, the design features of the carrier are prioritized around its mission, not the convenience of its crew. The relative luxury I experience on a daily basis didn’t prepare me for this, though I should have known. Not complaining; just explaining. If our arrival onboard with the arrested landing may have been a little anticlimactic, our departure was definitely memorable. The boarding procedure was the same, and while we couldn’t see anything as we taxied into position, we knew that our launch was imminent as the engines revved up, the whole airplane shook in its restraints, and the “flight attendant” raised and then lowered his hand. Remember, we are facing rearward in our seats, with belts and harnesses well tightened per instructions. Even so, when the “cat” was cut loose, we were forced back (forward?) into our restraints for what seemed a long time; actually about 2 seconds. That’s enough time to accelerate to about 105 mph (or is it knots? Whatever.) far better acceleration than even the hottest Tesla. Thus was the approximate and fitting end to a memorable day at sea. I’ve spent a quite a few days onboard luxury cruise ships, but I’d have traded them all for this experience, if that had been the price of admission. As a veteran of military service and as a patriotic citizen, I have always been a proponent of a strong military, so this experience only reinforced my confidence in their ability to “get the job done”. Also, we must remember that the military’s job is to execute the commands of our elected officials who have to make difficult policy decisions in our increasingly complex world. My apologies to our Navy hosts for my incomplete and/or incorrect representations or terminology. To an even greater degree than general aviation, the seagoing Navy has a vernacular which has evolved over hundreds of years, and is at times foreign to us landlubbers. To the Navy and EAA; my sincere gratitude for this opportunity. Last edited by DeltaRomeo : 07-18-2016 at 01:21 PM.